Webcam for Remote Desktop - Use local webcams in remote Windows session. The most convenient solution for redirecting local webcams to remote desktop session. Webcam for Remote Desktop is a high-performance software for redirecting locally plugged webcams to remote desktop session. So any video conferencing or other software that expects for a video stream will work. The software consists of two parts. The Workstation part is to be installed on the local computer where the webcam is physically present. The Server part goes to the remote side. Webcam for Remote Desktop creates a virtual camera in your remote desktop session and you can receive the video stream directly from the local hardware webcam. It provides you with high quality and low latency video stream allowing clear and stable video transmission to the remote session without any additional configuring. Webcam for Remote Desktop is fully compatible with DirectX. As a result it supports a wide range of software and hardware. It’s possible to use not only webcams as image source but also any DirectShow compatible hardware including video capture cards and ID scanners. All video-conferencing software works perfect using Webcam for Remote Desktop redirection. 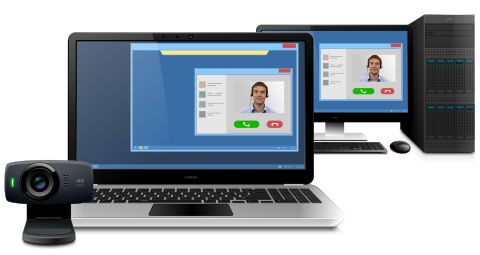 The list of supported software includes such popular applications like Skype, Lync, Google Hangouts, GoToMeeting, Webex, Adobe Connect and many others. Webcam for Remote Desktop supports also video chat on social networking services, like Facebook, Myspace, etc. 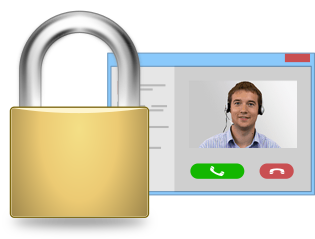 Webcam for Remote Desktop takes care of your confidential information. In case of multi-user environment (Windows Server 2008, 2012, 2016), if there are more than one user logged in to the remote side, each webcam is isolated within each individual user session. So you don't need to worry that your personal video stream will be seen by somebody else, even by mistake. 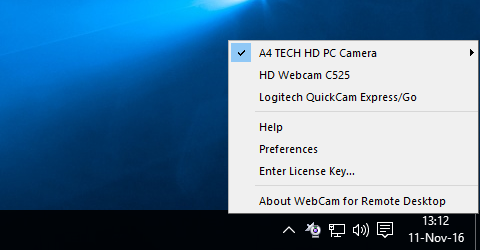 No one but you are able to see your webcam in the system. Thanks to on-the-fly compression, Webcam for Remote Desktop reduces video stream size and as a result increases the data transfer speed. The program supports different custom video resolutions and framerates. It’s always possible to configure the program in order to meet your network bandwidth and avoid frame drops. Native webcam drivers are not required on the remote side. 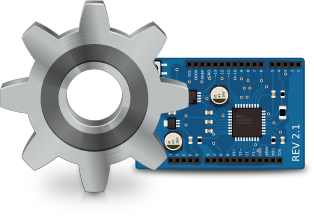 It’s not needed to install any drivers on the remote side every time you plug in a new webcam (new driver installation requires administrative rights and can be a headache for your system administrator). Webcam for Remote Desktop supports different remote desktop protocols including Microsoft RDP, Teradici PCoIP, Citrix ICA. It does not matter what environment is used (Microsoft Azure, Microsoft Terminal Services, Citrix XenApp, Citrix XenDesktop, VMware View, Amazon Workspaces and others). Any compatible Client software can be used for accessing remote side. And there is no need to change firewall settings. 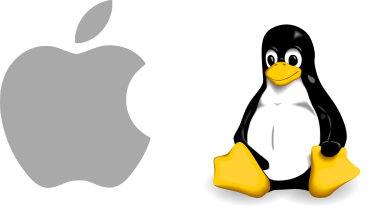 If you are looking for solution for Linux or macOS you have already found it. Webcam for Remote Desktop works perfectly in macOS and most distributions of Linux operating system. It includes plugins for FreeRDP (MacFreeRDP in case of macOS), Citrix Workspace app, Teradici PCoIP, VMware Horizon Client and Amazon WorkSpaces Client. Webcam for Remote Desktop works perfectly in seamless mode. It is easy and convenient feature which allows to connect your local webcam to any remotely running video application in seamless mode. We found Webcam for Remote Desktop. It was advertised that the software works even on slow network connection. Thus, we have installed it, and it works flawlessly. It has been very easy to setup and use. Webcam for Remote Desktop. Webcam redirection software allowing to use local video devices in remote desktop session.